Students receiving a diploma must earn a passing grade each year in 20 credits of standard high school plus one credit of Bible each year. There are eight 45-minute class periods per class day in Upper School. Classes meet for five days a week for two semesters, and partial credits are awarded for one semester classes. The school year is divided into four quarters and two semesters. To graduate from the Academy, a student is to take the ACT or SAT and be a full-time student at DCA for his or her final two semesters. 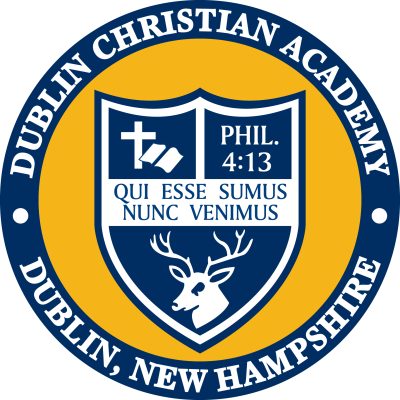 Students attending Dublin Christian Academy enjoy small class sizes which allow more direct teacher-student interaction and an opportunity for teachers to assist in each student’s academic growth. Individual academic counseling takes place each year with all Upper School students concerning his or her course of study. Students will be encouraged to elect courses leading to academic success according to their ability and future plans. To request a transcript, please click here to submit the request electronically or call the school office at 603.563.8505 and ask for the Registrar's Office. Please allow 3 business days to process your request. During the beginning and end of a semester, please note that the request may take up to a week to process.